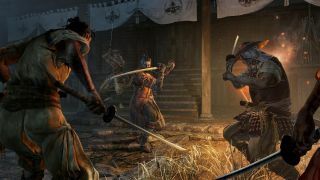 Sekiro: Shadows Die Twice is the game almost everyone's playing right now. Not everybody's in love with the number of minibosses in it, but Tom Senior's played Sekiro the most and his impressions are pretty positive so far. Samuel Roberts reviewed The Division 2 and played it for so many hours I'm not sure if he's been sleeping. He liked it a lot in spite of the story being kind of bad, which is typical for Clancyverse games, and went into detail on that over here. Samuel Horti's been hunting mammoths and surviving the harsh winters in Dawn of Man. For all that it's about guiding your people through difficult circumstances, it seems like an oddly relaxing game. At least until your goats run rampant. Chris Livingston played Espire1: VR Operative, a stealth game where you control an espionage cyborg working for the Australian government. As an Australian I'm pretty sure we don't have those, although knowing us things would probably go as badly as they did when Chris was in charge. I've been replaying Borderlands 2 in anticipation of the sequel's announcement, trying to finish a True Vault Hunter playthrough, which is what Borderlands calls new game plus. For the first time I'm really getting into the guns that don't reload—you chuck them when empty and they explode like grenades while a replacement digistructs itself in your hand. They do more damage if thrown with some rounds in the clip, which means my habit of reloading sooner than I should finally pays off. Enough about us. What did you play last week, readers? Have you picked up Sekiro, or one of the recent indie hits like Hypnospace Outlaw or Baba is You? Are you playing something older? Let us know.